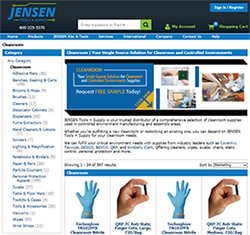 MOORPARK, CA, October 10, 2017 -- TestEquity/JENSEN Tools + Supply, a leading supplier of value-added test and measurement solutions, eMRO tools and supplies and environmental test chambers, announces the launch of its cleanroom product site. This site contains a comprehensive selection of cleanroom supplies that can be used in controlled environment manufacturing and assembly areas. As a top distributor for the eMRO customer base, TestEquity/JENSEN Tools + Supply works collaboratively with trusted industry leading cleanroom manufacturers such as Coventry, Texwipe, DESCO, BEVCO, QRP and Kimberly Clark. Products offered include cleaners, wipes, swabs, chairs, static control, personal protection and more. "With our new cleanroom production supplies site, our customers can depend on us for their critical and controlled environment requirements and needs. This new capability is integral to our corporate goal of helping customers make better purchase decisions, minimize acquisition costs and find the perfect solutions for their specific needs," said Toby Harvey, Director of Business Development, TestEquity/JENSEN Tools + Supply. "Our cleanroom manufacturers are trusted by a wide range of businesses in the electronics manufacturing, aerospace and aviation, biotechnology, pharmaceutical and medical industries." Leading cleanroom supplier Coventry has partnered with TestEquity/JENSEN Tools + Supply to bring the very best cleanroom supplies and service to customers nationwide. New cleanroom site visitors will receive a free cleanroom sample swabs & wipes evaluation pack. Ken Caskey, General Manager at ITW Contamination Control said: "Since 1992, Coventry has aggressively pursued the large global market for cleanroom products, with the benefits of a dedicated manufacturing, sales and marketing organization. I believe that this partnership with TestEquity/JENSEN Tools + Supply will help Coventry reach even more cleanroom businesses by ensuring that our products remain best in class and provide excellent value to the world’s cleanroom markets." For general information, please email at news@JensenTools.com or call 1-800-225-5370.